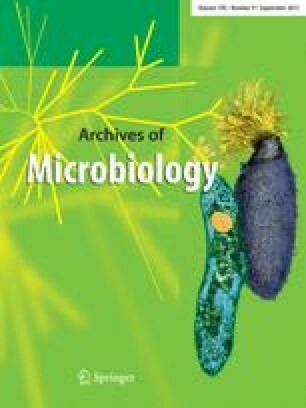 Taxonomic studies of deep-sea barophilic Shewanella strains and description of Shewanella violacea sp. nov.
Several barophilic Shewanella species have been isolated from deep-sea sediments at depths of 2,485– 6,499 m. From the results of taxonomic studies, all of these isolates have been identified as strains of Shewanella benthica except for strain DSS12. Strain DSS12 is a member of a novel, moderately barophilic Shewanella species isolated from the Ryukyu Trench at a depth of 5,110 m. On Marine Agar 2216 plates, this organism produced a violet pigment, whereas the colonies of other isolates (S. benthica) were rose-colored. Phylogenetic analysis based on 16 S ribosomal RNA gene sequences showed that strain DSS12 represents a separate lineage within the genus Shewanella that is closely related to S. benthica and particularly to the members of the Shewanella barophiles branch. The temperature range for growth and some of the biochemical characteristics indicate that strain DSS12 differs from other Shewanella species. Furthermore, strain DSS12 displayed a low level of DNA similarity to the Shewanella type strains. Based on these differences, it is proposed that strain DSS12 represents a new deep-sea Shewanella species. The name Shewanella violacea (JCM 10179) is proposed.